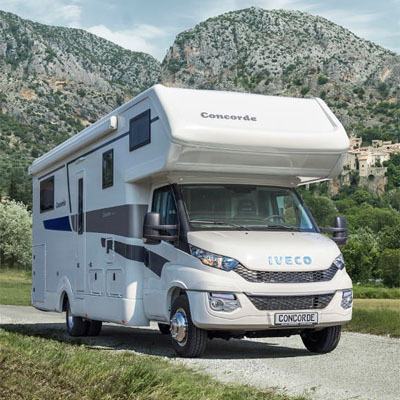 For many years Concorde have been building motorhomes on the Iveco Daily chassis. In fact they recently celebrated 25 years together with a limited edition Concorde Charisma Jubilee Edition. But recently their coachbuilt Cruiser range has been built on bigger chassis, the MAN, the Iveco Eurocargo and the Mercedes-Benz Atego. Southdowns are pleased to announce that for the 2016 season the more affordable Iveco Daily chassis is back, with a stunning new look and attractive models at attractive prices. Their are four models, most following the traditional layout structure of a Concorde, rear bedroom in various layouts, then going forward, bathroom, kitchen, living area and big double bed over the cab, the Daily 891 HS with a transverse rear bed and the 891L with rear longitudinal twin single beds. The rear highlights are the stunning new rear lounge models, the 791RL and the 890RRL. Click here for layouts and specification details. For more information, or to come and view the new Concorde Cruiser, please Contact Us.